Beer + music + electricity = Ultragoodness. 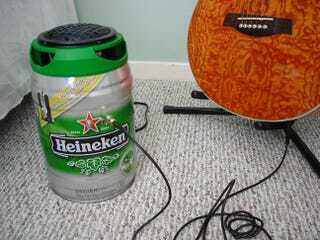 You can't go wrong with that formula and this do-it-yourself 20-watt Heineken Draught Keg Guitar Amplifier hits all the right chords perfectly. For $119, and looking this good, it's the perfect present for any drunk guy who loves beer, music, and whose birthday is just around the corner. Yes, that would be me.